The National Museum Zadar (Cultural-historical collection of the Island of Iž) and the University of Zadar prepared the exhibition Islands Iž and Rava on Old Maps on the occasion of the International Museum Day. 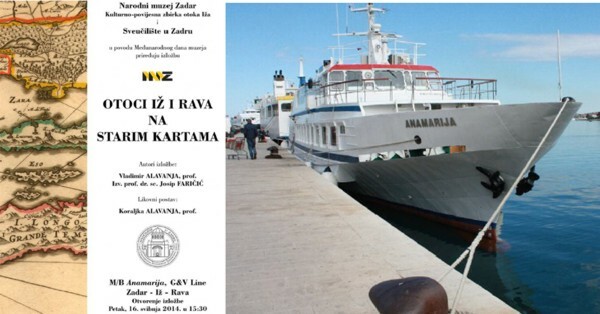 The exhibition was set on a passenger ship Anamarija owned by company G &V Line Jadera which connects islands Iž and Rava with Zadar. Visitors, mostly passengers on that route and on the Zadar – Sali – Zadar route with the same ship could see the exhibition from May 16 to 26, 2014. Considering that 200 small catalogues were printed containing an introduction and a list of exhibits and that more catalogues had to be printed, it can be assumed that the exhibition of old maps was very interesting to inhabitants of Iž and Rava, as well as other people who wanted to see how those islands were represented on maps in the past. Vladimir Alavanja provided the idea for the exhibition, and its form and location were arranged with Josip Faričić from the Department of Geography of the University of Zagreb. Two passenger saloons aboard Anamarija were chosen as the location of the exhibition in order to present the exhibits to the inhabitants and frequent travellers from Iž to Rava in the way that the maps were contextualized in the space they represent. The exhibits were placed as sections of high-quality prints of 30 selected maps and charts. Sections of old maps were printed on a high-quality paper, framed and hanged in place of curtains on ships windows. Art historian Koraljka Alavanja conceived such an artistic arrangement.